BRAKE and BREAK are easy to confuse – especially if you’re new to the English language. The fact that the two words sound the same – they’re homophones – means people commonly mix them up. 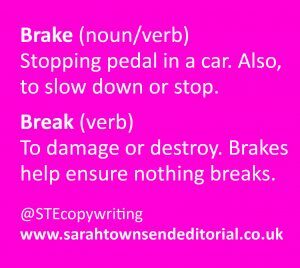 Here are my simple spelling tips to remember the difference between BRAKE and BREAK. BREAK is a verb that means damage or destroy. BRAKE can be both a noun and a verb. As a noun, a BRAKE is the stopping pedal in a car or other vehicle. As a verb, BRAKE means to slow down or stop – for example, a car.